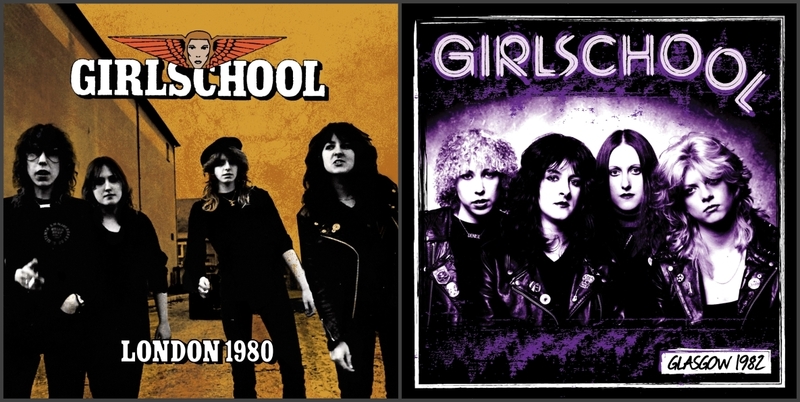 Los Angeles, CA – From the vault of one of the most respected and groundbreaking British hard rock outfits to emerge from the NWOBHM scene, the legendary Girlschool, comes two never before released concert recordings now ready to be shared with the world courtesy of Deadline Music. Both shows present powerhouse performances by the original, classic Girlschool line-up featuring guitarist/vocalist Kim McAuliffe, bassist Enid Williams, drummer Denise Dufort, and the inimitable lead vocalist/guitarist, the late Kelly Johnson. First up, London 1980, released on CD, demonstrates the awesome power of this band in a live setting before their hometown audience, as they perform cuts from their recently released and soon to be classic debut studio album Demolition including “Emergency” and “Nothing To Lose,” plus their explosive cover of The Gun’s “Race With The Devil!” Then, Glasgow 1982 picks up where the London show left off, featuring high octane performances of tracks from both 1981’s Hit and Run and 1982’s Screaming Blue Murder including “The Hunter,” “Live With Me” and more! These performances eventually lead to the ladies’ first U.S. tour later in 1982 opening for Iron Maiden and Scorpions, and establishing a devout fanbase in the States. This historic performance is available on both CD and in a special limited edition purple vinyl pressing. Girlschool are still going strong performing and recording with lead guitarist Jackie Chambers (who replaces Kelly Johnson). The band is currently touring North America through mid-June, after which they will embark on a massive European tour with Motörhead and Saxon in November! See http://www.girlschool.co.uk for details. This entry was posted on Sunday, May 17th, 2015 at 02:59	and posted in Girlschool, Press Release. You can follow any responses to this entry through the RSS 2.0 feed. « Ritchie Blackmore’s Rainbow Set To Release A Series Of Vintage Concert Recordings From 1979!